NEW! - Plastic Dunnage Bags. Click here for more information. Shipments Arrive Looking Like This? Extra Packaging's inflatable Dunnage bags are the logical answer to your shipping damage expense. They have an outstanding load stabilizing capacity, withstanding tons of pressure and resistance to load shifting. The high pressure bags are constructed of multiple layers of high strength extensible Kraft paper and the outer ply of our 6 to 8 ply is coated with polyethylene to resist moisture (coating is optional on our four ply bag). The inner liner is constructed of co-extruded polyethylene film for added protection against loss of air pressure. Tough, dependable, and easy to inflate, these Dunnage bags are a convenient way to protect your cargo. The most important component to saving money is saving time. With Extra Packaging's dunnage bags, time is no problem. Dunnage bags are easier and less expensive to install than wood bracing because there's no carpentry, construction or teardown time. 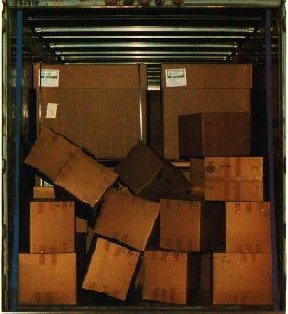 Rubber dunnage must be carefully deflated, removed, folded and returned after each shipment. If it's lost or damaged, it means additional expense. But these lightweight, easy-to-position bags inflate easily and quickly. There are no special storage requirements or repairs: simply deflate the bags and throw them away. Protect your cargo with a strong dependable cushion of air with Extra Packaging's dunnage bags. Extra Packaging is committed to providing flexible packaging solutions for all your shipping needs. If your business requires anti static bags or static control packaging, please see our Anti-Static Bags & Specialty Products section. Or if you require high pressure bags for bio-hazard transport, please see our Bio Hazard Packaging section. Dunnage bags exert constant pressure thus reducing the adverse effects of over-the-road vibrations and bumps. Dunnage bags can be used to brace heavy palletized loads, such as in this case filled 55 gallon drums. Small irregular loads can be locked into place using Dunnage bags. By using the Dunnage bag bracing method in railcars, full use of doorways are permitted. The panel products industry relies heavily on Dunnage bags for filling voids no matter how tightly lading is positioned.. 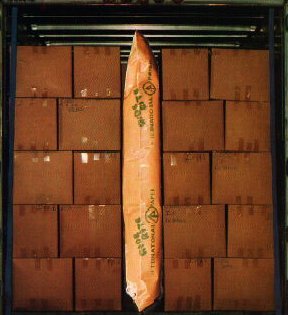 Bagged products as well as non-unitized loads can be safely braced with Dunnage bags.